On May 21st, a high altitude balloon platform was flown to the edge of space. �This mission, named Away 26, was flown by JP Aerospace of Rancho Cordova, California. In addition to it's scientific and research duties, Away 26 served as a billboard at the edge of space.�� "Some companies like to advertise on race cars, I like to use the planet Earth". Says John Powell, President of JP Aerospace. 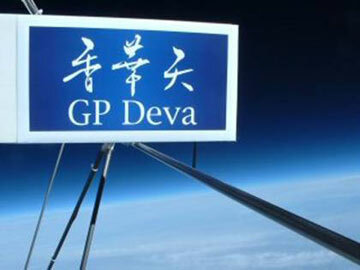 Image: Billboard at the edge of space: GP Deva, a unique line of botanical mists, essential oils�and herb tea products for health and beauty. With soaring interest in Richard Branson's Virgin Galactic, Star Wars and orbital tourism, space is rapidly becoming the next marketing frontier.� "Companies are looking for ways to get above the over crowded field of advisements",� states Powell. "There are a lot of race cars and basketball stars out there, but, not too many spaceships, they get noticed.� The field is wide open". The vehicle flew for two hours and forty minutes to an altitude of 77,905 feet above Black Rock Desert in Nevada, USA.� This flight was part of the Airship to Orbit (ATO) program.�� ATO is a plan to build large airships that will fly directly to space.� Away 26 tested radio and computer systems for the orbital airship. Away 26 was the eighty-sixth mission flown by JP Aerospace.� JP Aerospace is an independent space program staffed by volunteers dedicated to bringing space travel to everyone.